Detroit has a water problem. Or, more correctly, it has a stormwater problem. Every time it rains, Detroit officials cross their fingers in hopes the city’s antiquated sewer system can handle the volume of stormwater that gets flushed into thousands of drains in parking lots and along city streets. In many cases, those drains are connected to sewer pipes that also carry sewage to the city’s wastewater treatment plant. When the system is overwhelmed with stormwater, which is happening with more frequency, the combined sewers end up discharging untreated sewage directly into local streams and rivers. And during heavy rains, as residents have suffered through on at least three occasions this summer, basements also flood because they are hooked up to the same drains. These combined sewer overflows discharge billions of gallons of untreated sewage into the Great Lakes each year, are the prime source of pollution in the Rouge River and are one of the main factors in the algae blooms impacting Lake Erie. To alleviate the problem, you might say the city is turning to a natural ally. Rather than build more and bigger (and more expensive) pipes to capture the stormwater, the city is looking to nature to help out. Under the direction of Mayor Mike Duggan’s office, the city is focusing on green infrastructure projects, including the elimination of impervious ground surfaces that don’t allow water to soak through, and constructing bioswales (similar to large vegetated ditches), wetlands, rain gardens and other methods that allow rain and snowmelt to more naturally filter into the ground, rather than running off into city sewers. Fortunately for Detroit, the city controls large swaths of vacant land where these projects can be constructed. According to Gary Brown, director of the Detroit Water and Sewerage Department, the city directly controls about 40 percent of Detroit’s 138 square miles, giving city leaders a vast canvas for the new program, which began in earnest back in 2010. The move away from “gray” or traditional infrastructure – basically pipes – is definitely a change of philosophy for the city. In fact, the original plan to deal with many of the combined sewer overflows (or CSOs) still in operation was to construct a massive underground tunnel 30-feet in diameter that would’ve had the ability to capture more than 200 million gallons of stormwater when it rains. It was also going to capture some of the remaining CSOs in Dearborn Heights and Redford Township, and be built along a seven-mile stretch of the Rouge River. The project was supposed to be completed by 2015, and construction crews even began some of the preliminary work. However, in 2009, city officials scrapped the project because it was determined the estimated $1.2 billion price tag for the tunnel was just too costly for the city residents to absorb. Instead, the city worked out a deal with the Michigan Department of Environmental Quality that allowed Detroit to shelve the tunnel project in favor of green and blue infrastructure strategies over the course of two decades. The work, much of it recommended through the Detroit Future City initiative, drew upon two of the city’s most daunting challenges – a shortage of money, and miles upon miles of vacant or abandoned land. According to Palencia Mobley, DWSD deputy director and chief engineer, the change will be far less costly for the city and ratepayers to the regional water system. Instead of $1.2 billion for more pipes, the water department will spend approximately $50 million on green infrastructure projects in the Upper Rouge sewershed area, on the city’s far west side, where CSOs have plagued the Rouge River for years. Mobley said the city has until 2029 to complete the projects. “Detroit has a unique opportunity because of the vast amounts of vacant land available to us. If we use that to our advantage, we can truly reimagine the city and make it one of the greenest cities in America,” Mobley said. In fiscal year 2016, the city will spend $6.6 million on green infrastructure projects. Several have been completed, including the construction of four bioretention gardens on vacant lots in the Cody Rouge neighborhood, which was a collaborative effort with the University of Michigan. Stormwater is directed into these vegetated garden areas where it will percolate naturally into the ground. In essence, they act as natural wetlands. City officials say each of the gardens was designed to reduce stormwater runoff into local sewers by 300,000 gallons annually. Several projects are currently under construction, including at local parks, along roadways and on vacant lots. For example, the city is spending nearly $1 million to completely redesign Viola Liuzzo Park, located on the city’s northwest side, as part of Mayor Duggan’s 40 Neighborhood Parks initiative. In addition to adding new playground equipment and walkways, a significant component of the plan is to construct three large bioretention gardens that will reduce stormwater runoff in the surrounding neighborhood. Right now, they look like large holes filled with muddy water, but once they are finished, they will thrive with native plants and flowers. Mobley said the features will be an attractive addition to the park and neighborhood, in addition to protecting residential basements. “These green infrastructure projects will increase property values, so there is definitely a property benefit. But there are also social benefits. They create civic pride, which is one of those intangibles that is hard to define,” Mobley said. Not too far from Liuzzo Park, Stoepel Park is also undergoing a big facelift, as construction crews dig out large bioswales along adjacent streets. Mobley describes these bioswales as large ditches that line one side of the street (the park side). They will capture the surface water from the impervious street and driveways when it rains, and prevent it from getting into storm drains. The bioswales will include native plants and flowers and resemble wetlands when filled with stormwater. “Most of them look like gardens. Most people won’t even know what they are,” Mobley said. The city is also reconstructing a number of streets with pervious asphalt and pavers that have small openings for water to pass through and soak into the ground. Crews are currently installing these pavers along Keeler Street in the Rosedale Park neighborhood. A similar project will take place on Artesian Street between Joy and Cathedral. While Mobley acknowledges the projects the city has completed thus far are fairly small, she said every bit helps, particularly when you take into consideration climate change is causing more intense storms on a more frequent basis that are causing more damage. She pointed to the record-breaking storm that occurred on Aug. 11, 2014, which flooded thousands of basements in Detroit, and caused more than $1 billion in property damage across Southeast Michigan. This summer has produced three rainfalls that flooded basements in the city. Gary Brown has been the director of DWSD for less than a year, but said the his department has been trying to deal with its sewer overflow problem since the mid-1990s. In fact, DWSD was under federal oversight for 35 years because it was non-compliant with federal clean water laws. Brown contends green infrastructure is a major factor in solving the sewer overflow problem. He said he’s working with other city departments to develop new ordinances that will make it easier to find green solutions and ensure that new city developments aren’t putting more pressure on the stormwater system. “This can’t just be a DWSD project. We have to get all the city departments involved, including Parks, Economic Development, and the Department of Public Works. This has to be a complete city project, with everyone working together. That’s what Mayor Duggan wants and that’s what we’re doing,” said Brown. One of the biggest challenges is getting commercial landowners to buy into the concept. Detroit has many industrial complexes. Because they tend to have large, impervious surfaces including rooftops and parking lots, they tend to send massive amounts of stormwater into the sewer system. So the city is trying to convince these businesses to create their own green infrastructure or retention basins. One way to do that is by charging landowners monthly drainage fees, which were implemented to cover the cost of cleaning up runoff. Brown said some property owners have begun approaching the city about alternatives and to see how they can disconnect from the system. City officials have found residential homeowners to be more naturally receptive to green infrastructure. Projects don’t have to be large to make a positive impact. That’s why the city has encouraged residents to install rain gardens in their yards and neighborhoods. One group leading the charge is Friends of the Rouge www.therouge.org , which has taught residents for years on the construction of rain gardens to reduce stormwater into the Rouge River. FOTR has partnered with the Sierra Club, Keep Growing Detroit and the Erb Family Foundation to begin Rain Gardens to the Rescue, which offers workshops specifically for Detroit residents interested in installing their own rain gardens. Rain gardens are typically installed in areas that collect water, near downspouts for example, and include native plants like purple coneflower, black eyed Susan, and little bluestem. These plants have longer root systems and absorb more water than turf grass. 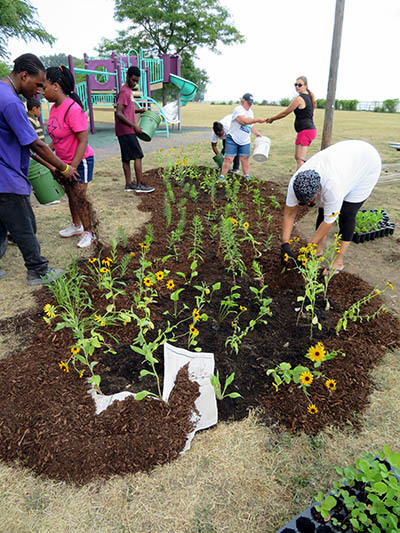 According to Cyndi Ross, the group’s river restoration coordinator, workshops led to the installation of 13 rain gardens in northwest Detroit last year, including one at Cody High School. This year, they are scheduled to install 14 more on the Eastside, and they hope to install at least 20 more in 2017. The Fred A. and Barbara M. Erb Family Foundation provides the funding, so there is no cost to the homeowners as long as they provide enough volunteers. That’s the kind of talk that gives Brown hope that the city is on the right path to solving its stormwater problem. One success builds off of another, he said. This is a fantastic development! Thanks for running this story. In addition to ameliorating storm water drainage problems, rain gardens filled with native plants also feed pollinators and native insects, promoting a sustainable, healthy, and beautiful environment. In a weird way, because Detroit has so much open space and potential for change, it can rebuild itself for a sustainable future in ways unavailable to any other major North American city. Bravo to the Detroit W&S Dept, to Erb Foundation, and to all the groups and individuals making this happen! The Monarch Butterflies thank you as well.